SIDAC Switching Thyristors suit capacitor discharge applications. With 150Â°C junction temperature and 280 A pulse capability, unidirectional Kxxx0S1URP and Kxxx0GURP Series consistÂ of semiconductor switch used in conjunction withÂ capacitor and transformer in capacitor discharge ignition circuits. SIDAC (Silicon Diode for Alternating Current) design promotes repetitive pulse current rating atÂ elevated ambient temperatures andÂ breakover/trigger voltage versus temperature characteristics whileÂ minimizing switching loss. 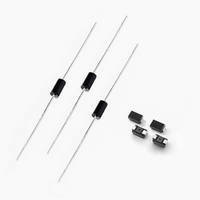 CHICAGO — Littelfuse, Inc., the global leader in circuit protection, has introduced two new product series, the Kxxx0S1URP and Kxxx0GURP Series Unidirectional SIDAC Switching Thyristors. A SIDAC (short for Silicon Diode for Alternating Current) is a semiconductor switch used in conjunction with a capacitor and a transformer in capacitor discharge ignition (CDI) circuits for generating high voltage spikes. The Kxxx0S1URP and Kxxx0GURP Series offer lower switching losses than existing high-energy SIDAC and standard SIDAC products. A new SIDAC design provides a higher repetitive pulse current (ITRM) rating at higher ambient temperatures, improved breakover/trigger voltage vs. temperature characteristics, and lower switching loss. This allows existing circuits to support higher voltage outputs, and ensures stable voltage outputs at high ambient temperatures. Typical applications for the Kxx0yU Series SIDAC/Unidirectional Thyristors include high-power flame ignition modules designed for gas cooking appliances ranging from portable, tabletop types to commercial-grade multiple-burner models, gas water heaters and oil heaters of all sizes, and ion generators. Lower switching loss (VT) than existing SIDAC series while keeping high 280A pulse capability allows generating longer high-voltage pulses or generating multiple outputs by supporting higher discharge current. Improved break over/trigger voltage (VBO) vs. temperature characteristics means there is no degradation of the pulse voltage at high ambient temperatures. High junction temperature (TJ) of 150°C (for part numbers K2200,K 2300, K2400 and K2500) ensures longer field life and high reliability in the high ambient temperatures common in gas ignition modules of cooktops and water heaters/boilers. Lower IBO/faster switching than existing Kxxx0SHURP/GHURP Series allows for a higher instantaneous rate of current change (di/dt) in the discharge current pulse, resulting in a higher voltage output. The Kxxx0S1URP and Kxxx0GURP Series Unidirectional SIDACs are available in either a robust DO-15 axial package or a compact SMA (DO-214AC) surface mount package. The axial DO-15 version is available sold in tape-and-reel packed in quantities of 1,000 or 5,000. The surface mount version is provided in tape-and-reel packaging in quantities of 5,000. Sample requests can be placed through authorized Littelfuse distributors worldwide. For a listing of Littelfuse distributors, please visit the Contact Us page on Littelfuse.com. Additional information is available on the Kxxx0yU Series product page. If you have technical questions, please contact: Daisy Wang, product marketing manager, DWang2@littelfuse.com.